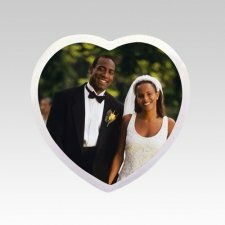 Want to place a Picture or Photo on a Headstone or Urn Niche? The heart has long since been a strong symbol of love. Since, roughly, the end of the middle-ages, this famous shape has been utilized by countless individuals to express their undying sense of adoration, whether it be romantic or plutonic. This recognizable shape represents our emotions for one another, and is probably one of the few symbols that has the same meaning across the globe. It is quite interesting that that such a simple symbol can help easily express an emotion that is profoundly perplexing. While that may be so, the heart shape is still very commonplace among many cultures, and the fact that it is so easily understood is what helps make this symbol all the more powerful. With that said, the application of this shape to a beautiful tribute that celebrates a lifetime of precious memories can truly help create an unforgettable remembrance. 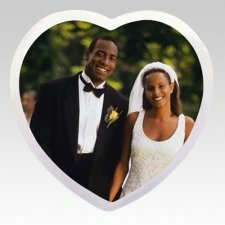 Our Pictures for headstones are made of ceramic, just as our other durable portraits, but is the only style that features a truly unique shape, which is that of a heart. This beautiful plate is available in two sizes, the smaller of which can be further adorned with a gorgeous bronze or chrome frame. These frames are available in a simple and sleek, as well as a highly-decorative style. The picture itself will hold a photo image in full color, to help keep the precious memory vivid for all the years to come. The resilient ceramic used to create these wonderful portraits makes them ideal for placement on any new or existing memorial, or even in a mausoleum. The ceramic picture is backed by a lifetime guarantee against fading, deterioration, breakage, and vandalism, to help provide peace of mind. Offered with each portrait is an optional, industrial-grade tape backing, which will resiliently hold the portrait to any smooth surface. The combination of the tape and the guarantee helps provide peace of mind in knowing that this wonderful and touching remembrance will forever capture and hold the love of a lifetime. The continuous use of the heart shape through all of the centuries has helped create an icon that is easily understood, regardless of age, race, cultural background, or even social status. Just as love has the power of unifying individuals, this shape has helped unite our own understanding, even if it is in a small, or seemingly insignificant, way. This is just one way that the power of love can truly overcome all barriers, as the symbol used to represent it has. It is only fitting then, that such a strong symbol be used to pass along a true love created, to our many future generations. "Very similar to the one I considered from the Funeral Home, but cost was hundreds less and delivery was only 2-3 days."